I’m so excited to share an update of our Kalamazoo house with you today! We bought the house back in June of 2018 (our first house!) and we’ve been working non-stop on it since then. Or at least it feels that way. When we first moved in, there were two options for our master bedroom location. 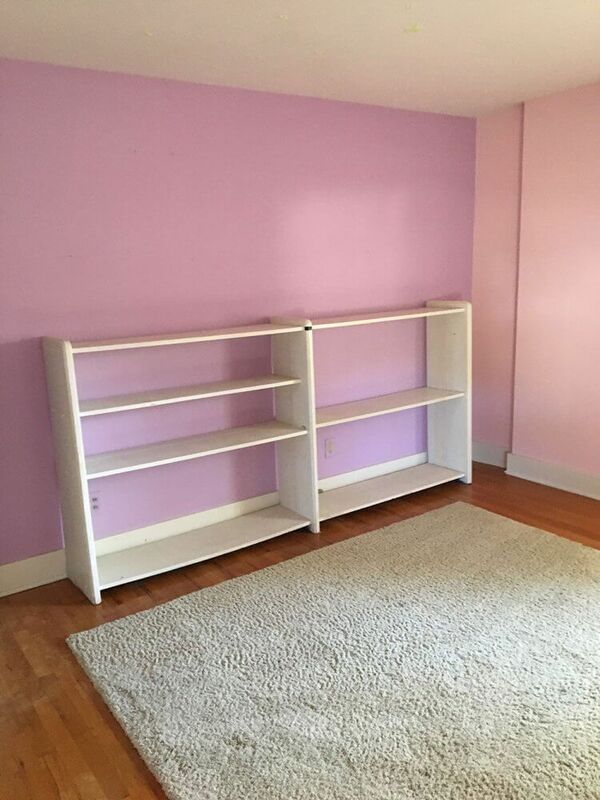 We ended up sticking with the smaller option, because the bigger option was painted pink and purple. Don’t get me wrong, I’m all about pink, but… not that pink. Then, something surprising happened. 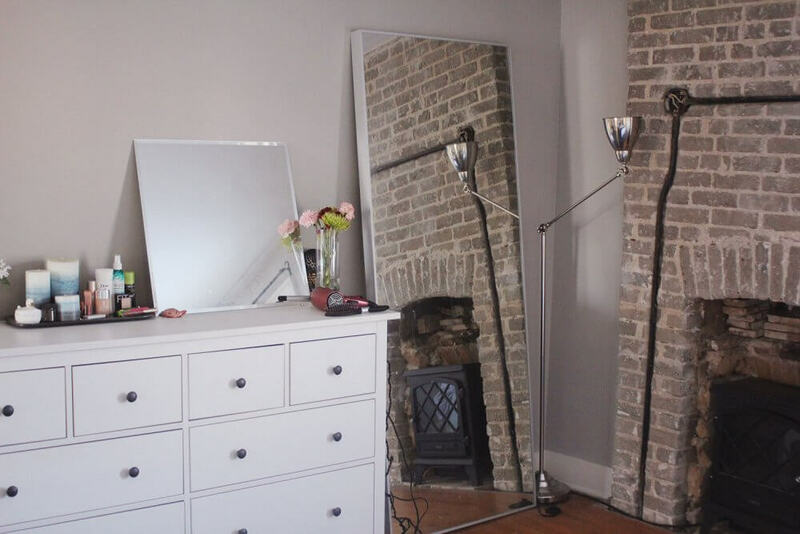 There was a small bump-out along the front wall, and we realized it was the chimney, and wanted to uncover it to have a cool exposed brick wall. 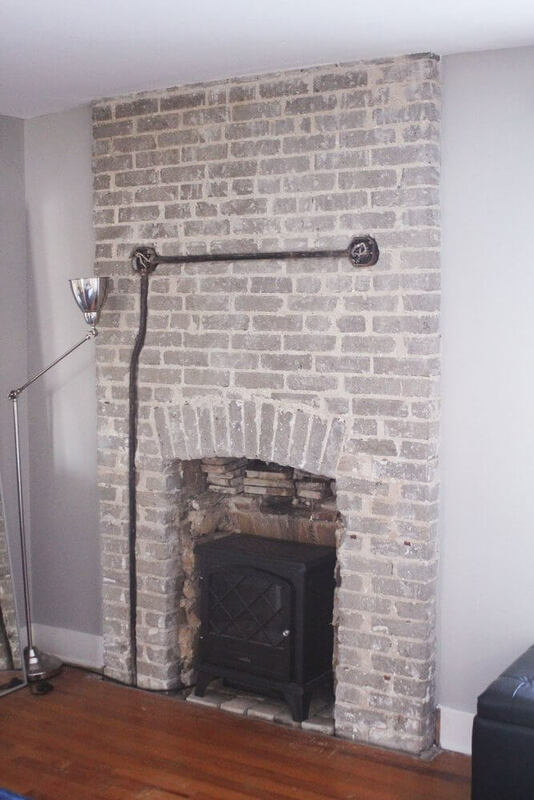 But when Sean was removing plaster, we realized it wasn’t just a brick wall… there was a fireplace back there. 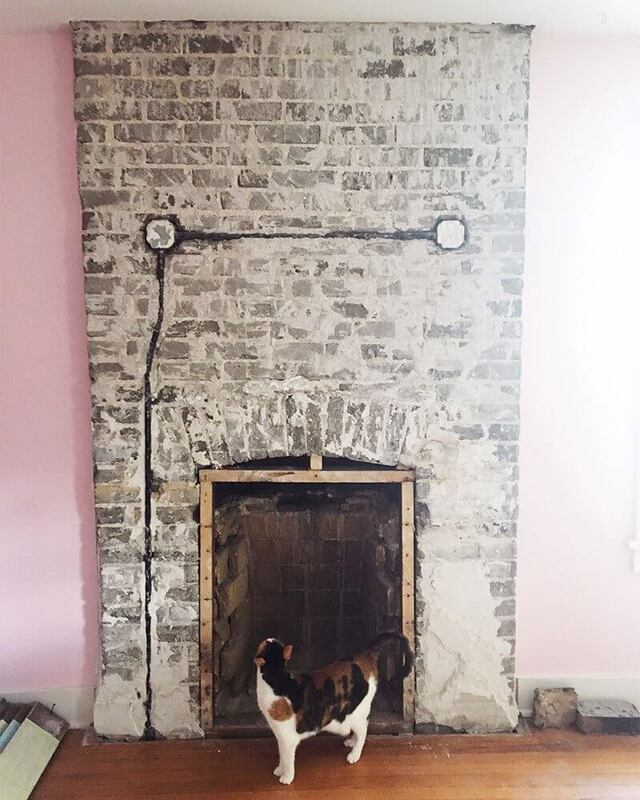 Here’s a photo of the fireplace when we first uncovered the whole thing (hi Val! ), and a photo of it now. Sean did a ton of work exposing all of the brick and cleaning it up. We eventually had someone come out to look at it (okay, like 4 people come out to look at it… the 4th time was the charm on this one), and we’re currently saving up to refinish it. It’s not even close to up to code right now, so we can’t use it in its current state. It actually looks like they closed it up in the 40s (?!?) and we’re not entirely confident it has ever been used. The plan is to add an electric insert into the fireplace. That makes the most sense, because a wood-burning fireplace in our bedroom would make us / our clothes / our bedding smell like a campfire 24/7. I love campfires, but I don’t want to smell like one all the time. And a gas insert isn’t the best idea in a bedroom, because if a gas leak happens while you’re sleeping, well… you can imagine the rest. Those two cable boxes are live (we’re lucky the plaster that was shoved in there never caught on fire! ), so adding an electric insert shouldn’t be too much work. They’ll be able to use the wires that are already there instead of having to run new stuff up to the room. For now we’ve got our imitation fireplace space heater shoved in there, but stay tuned for an electric insert update! When that happens, we’re going to add a mantel and probably plaster the brick above the mantel (sorry, Sean!) and put some sconces up where the cable boxes are. Once we found the fireplace, we knew this had to be our master bedroom, so I got to work on painting everything after all of the plaster debris was cleaned up. Pretty much as soon as the paint was dry, we moved all of our furniture in! It’s a little bit tighter than we originally anticipated, thanks in part to the fireplace. That’s a big chunk of wall we now can’t put anything against. But we’re really happy with it and wouldn’t trade some extra storage for our awesome fireplace! Other than painting and the fireplace, we haven’t done a bunch to this room. 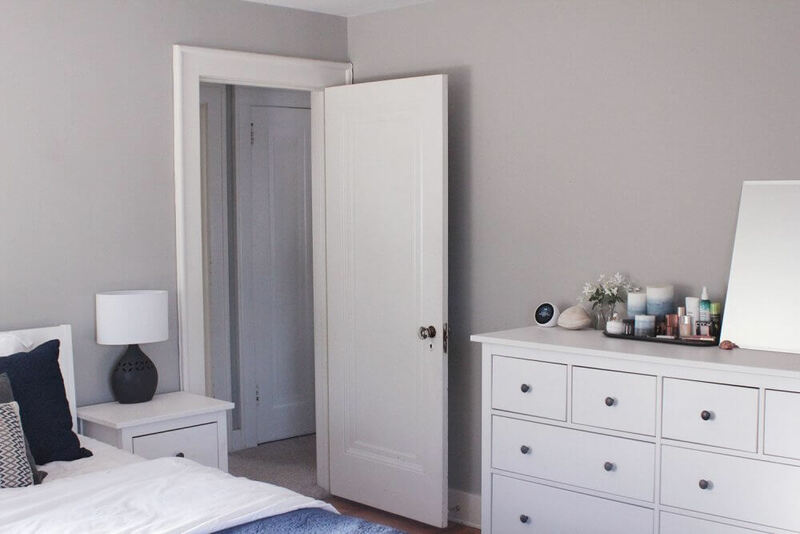 We had all of the furniture already—we bought it in Cincinnati and brought it with us to Kalamazoo, and moved it from one bedroom into the other once the paint was dry. The only thing we’ve purchased so far is the rug, which we love. We didn’t have any rugs in our house in Cincinnati, because almost all of the rooms were wall-to-wall carpet. In Kalamazoo, only one room and the stairs / upstairs hallway have carpet, so we knew we had to bring in some rugs. Winters in Michigan are cold! 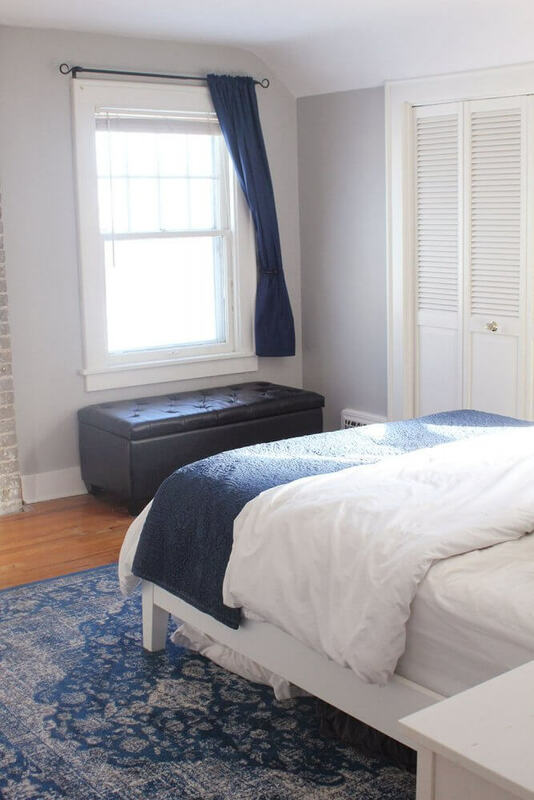 Luckily we found three amazing rugs online and got a huge Black Friday discount on them. I’ll link to the rug we bought for the bedroom below. 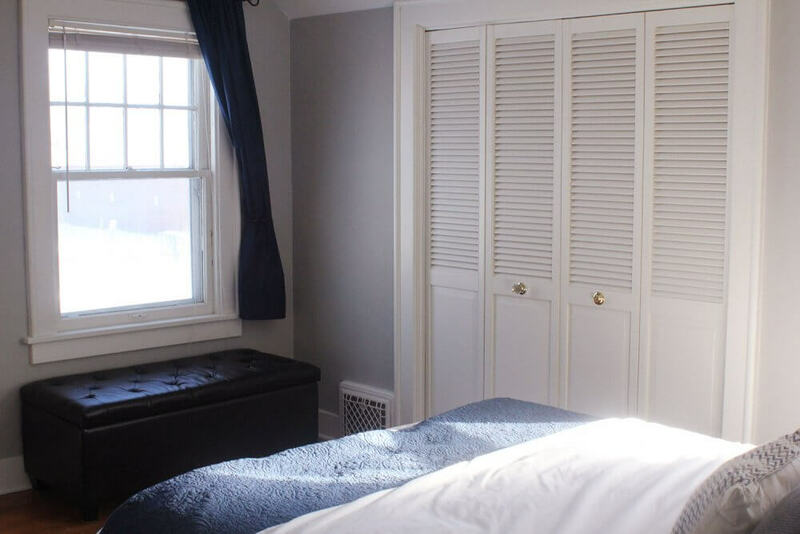 One downside to choosing this room as our master bedroom is the location—the window across from our bed faces a school parking lot, which means big flood lights on all night. One night I got so frustrated with it that I pulled out our old light-blocking curtains and stapled them to the top of the window frame. A few days later we put up the curtain rod to make them a bit more permanent. Even still, I sleep with an eye mask now and that has helped immensely. So there you have it! 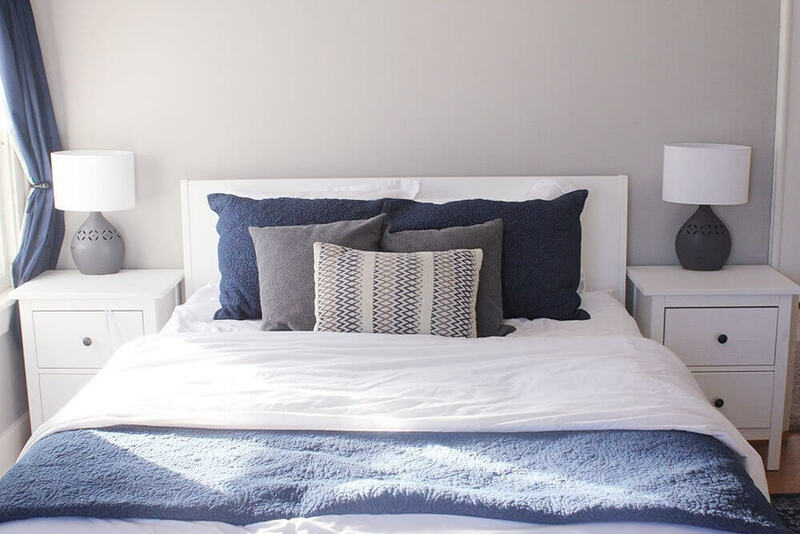 A master bedroom that feels very us. Of course, nothing in a house is ever ~done~, so we’ve still got plenty that we want to do, but this room feels ~good enough~ for now. Lovely. Blue is my favorite color. 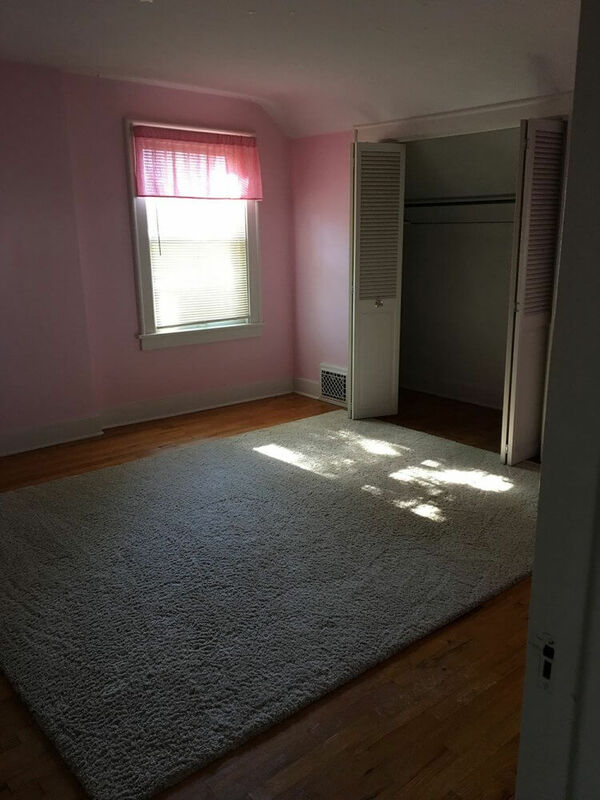 This room looks so light and bright. Love it! Thank you for sharing. Mine, too! Well, one of them. 😛 Our house is mostly white, grey, and blue. It’s so calming!